A Thanksgiving day meal fit for an astronaut: NASA-packaged smoked turkey, cornbread dressing, strawberries, tea w/sugar and as-flown cranberry sauce spread. Astronaut Michael Lopez-Alegria didn't need to request any special foods be launched to the International Space Station for this Thanksgiving: He had everything he needed on his regular menu to prepare the typical American holiday meal. "He does have smoked turkey on his menu, as well as candied yams and cornbread dressing," explained Dr. Michele Perchonok, NASA's manager of the Space Food Systems Laboratory. "He has sent down the information that he will be eating them on Thanksgiving day." In fact, Lopez-Alegria and his Russian and German crew mates have a practical cornucopia of foods with them on the orbiting outpost. From meat in a tube to meals made by celebrity chefs, their pantry may rival kitchens on the ground for their variety. The ISS menu certainly exceeds the space pantries that came before it. On the earliest of American space flights, food wasn't an issue. The sub-orbital hops made by Alan Shepard and Gus Grissom were each less than a half hour long; if the pilots were hungry, they could wait until they returned to the ground. As space flights became longer though, the need for food sent NASA looking for microgravity-friendly solutions. The most famous of these early space foods was not a food at all but rather a drink. Ask someone to name what astronauts consume and you are more than likely to hear in reply "Tang". "We never put on the package 'Tang.' What's on the package may say 'orange drink' or 'peach mango drink,' but it won't say 'Tang.' One of our beverage suppliers is what's now Kraft, was General Foods [which] makes Tang. They sell Tang both in the U.S. and internationally, so we pick and choose whatever flavors we want," Dr. Perchonok told collectSPACE.com on a recent tour of her lab. "The myth though, is that Tang was developed for the space program. The actual truth is [that] General Foods was making its travel drink mix and NASA thought, 'Oh, this is how we should be flying our beverages.' So we purchased the already made and commercially available product." 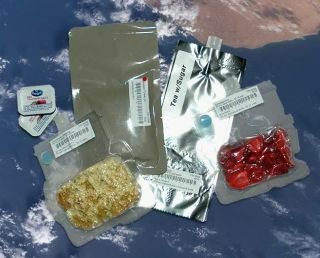 Whether prepared in NASA's kitchen or purchased from the store ready-to-eat, all foods and drinks are not ready to fly until they are specially packaged for space flight. Tang may come pre-packaged in handy single-servings on Earth, but pouring its crystalized flavoring into a cup becomes troublesome when there isn't gravity to keep it from floating around. Early space food containers consisted of toothpaste-like squeeze tubes and plastic wrapped bite-size pieces. For food and drinks especially, containers were needed that could let water in (for either heating or reconstituting) but not let it out until an astronaut wanted. The answer came in several evolutions of valve- sealed bowls and bags. The modern Tang container starts as a vacuum packed single serving inside a mylar expandable pouch closed at its top by a plastic valve. Astronauts inject water with a needle through the valve, mix the contents by shaking or kneading and then insert a plastic straw by which to sip. The straw has its own clasp that is used to halt the flow when desired. Gemini and Apollo era foods were packaged much in the same way, only with a larger opening by which to insert a fork or spoon. The meals were freeze-dried or dehydrated both to preserve them until they were ready to eat and to save on storage space. The process also made possible more of a variety on the menu. When Apollo 8 circled the Moon on Christmas Eve 1968, the crew had fruit cake to rejoice. When Neil Armstrong and Buzz Aldrin touched down at Tranquility Base, their first lunar meal included turkey. Spaghetti was a favorite for Apollo 12's lunar module pilot Alan Bean. Others ate butterscotch pudding, scrambled eggs and meat patties. The selection expanded with the additional storage made available by the space shuttle. In addition to freeze dried foods, astronauts could pick from "crew choice" or pantry items as snacks. These included trail mix, nuts, cookies, crackers and one particular candy. "Candy coated chocolates, candy coated peanuts and I believe we have candy coated almonds. We don't rub off the 'Ms' but we do not got out of our way to say they are 'M&Ms,'" said Perchonok with a smile. With freeze dried, crew choice and thermostablized (think military meals-ready-eat) foods available, selecting what to pack for a two week shuttle flight, let alone six months aboard the space station could be a challenge were it not simplified by Perchonok's food lab. The process starts about nine months before a mission. "The crew comes here, a shuttle crew for about an hour, usually around lunchtime, they sit around a table and we provide them with tastes of about, maybe 20 to 30 of our items. Meanwhile, we talk to them about [alternatives like] 'Well, you are trying the vanilla breakfast drink. We also have strawberry and chocolate,' Perchonok gave as an example. "While they are here, tasting the product they rank it [on] a scale of 1 to 9, where nine is great and one is not so great. We tell them, 'If you score it six or higher we have the option to put it on your menu.'" The astronauts are also provided the full list of available menu items, from which they can also choose. They are given several months to submit their menus, which are then provided to a dietician to insure they are nutritionally complete and will provide enough calories. Perchonok meets with the crew twice more, once two or three months before the mission and then while they're in quarantine to confirm any changes to the menus. "On the ISS side, they go through three food sessions, where they will eat every single item that we have on the food list so they can truly pick what they like and don't like," Perchonok described. On average, shuttle astronauts will consume about 70 percent of the food they take with them; on station, its as high as 95 percent. Within the past couple of years, it has become trendy for celebrity chefs to adapt their recipes for space flight. The likes of Wolfgang Puck and Emeril Lagasse have seen their culinary creations consumed by astronauts on the shuttle and space station. Television personality Rachel Ray will have three of her meals taste tested on STS-116 launching next month. For now, the chefs' specials are not part of crew menus; their meals are packed with the candy-coated chocolates as optional items. Will the future of space food be more of the gourmet? "Two of [Emeril's] items, the spicy green beans and the rice pudding, we're actually changing the recipe a little bit to have that on the menu at some point in time," revealed Perchonok. "And the others we could also but, those two [Emeril] items fit a niche so that is why we picked those." But those are largely the exception. Looking forward to Orion and NASA's return to the Moon, Perchonok says that its the wrapper, rather than its contents that is likely to face immediate changes. "The food itself probably won't change a whole lot. What we're looking at though is packaging: if we can find a lighter weight, higher barrier packaging, or at least an improved packaging that might not create as much trash afterwards." As the missions grow longer, the food labs attention will be directed to longer shelf-lives and growing ingredients. "On the outpost of Moon as well as Mars, it is very likely we will grow vegetables and fruits, and then we'll have a real galley because you've got 1/6th gravity for Moon or 3/8th gravity for Mars so you can actually prepare foods and not be eating out of packages all the time. So we will look at stir fry with the vegetables with packaged meat or something [like that]." "We'll also start looking at bringing up in bulk items like wheat berries or soy beans and then processing those into editable ingredients, like with the wheat berries we'd make wheat flour and then we'd be able to do pasta or cereal or breads. The soy we might make into a meat analog or soy bean oil or tofu. So we'd be doing that kind of work also." For Perchonok the whole point is providing a fresher food system and to save on mass and volume. "A 1000 day mission to Mars for a crew of six will need about 10000 kilograms if we went with our packaged food system. If we can save on that by growing some items, by bringing some items up in bulk, it will be a lot easier at least in the mass and volume arena," said Perchonok. Copyright 2006 collectSPACE.com. All rights reserved.